So much to celebrate! Wishing you a lovely anniversary full of wonderful memories. When you're in love, the best thing to hold onto in life is each other. On your wedding anniversary, may treasured memories and hopes for future years be with you both. An anniversary is a time to celebrate the joys of the present, memories of the past and hopes for the future. May your love and commitment to each other continue to bless you both in countless ways. True love is like a box of chocolates - sweet, enjoyable and full of surprises! Enjoy your celebrations and have a very Happy Anniversary! True love never dies. Congratulations on your anniversary and for your continuing love and commitment to each other! Happy Anniversary to a wonderful couple. You are an inspiration to all those around you! 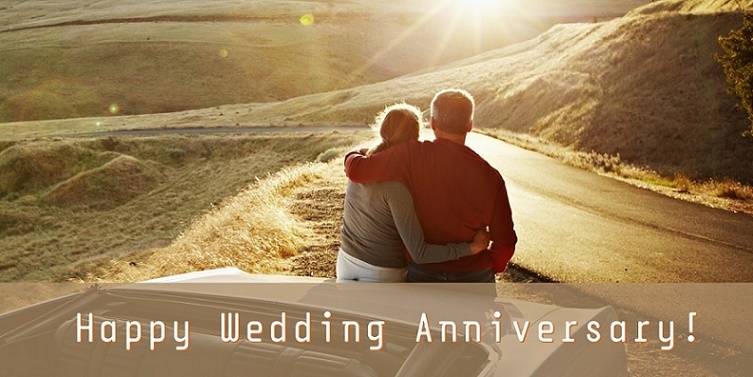 Your wedding anniversary is a time to celebrate the beauty and joy of true love. May you both be blessed on this special day! Happy wedding anniversary to you both! May your marriage continue to be blessed with countless happy moments, genuine love and truly joyful experiences. Your wedding anniversary is a wonderful and joyful day. Wishing you health and happiness on this special occasion. Your love each year grows more and more! To my wonderful parents on your happy day. Have a great time celebrating together, and may there be many more special memories to come. To my loving wife on our wedding anniversary. Words cannot express my love for you, which continues to grow each passing year. To my wonderful husband on our anniversary. With all my love and gratitude for all you are, and for all you do. Marriage is a gift, and true love is timeless. May your lives continue to be blessed with happiness and joy in each other's company. Anniversary wishes to a very happy couple. May the countless joys and blessings of marriage remain with you forever. Love makes the world go around! Congratulations on your happy anniversary, for your continuing commitment to each other.